Both graphics and visuals are helpful in enhancing knowledge and improve understanding. This holds true in regard to infographics. The visual illustrations offer information in a way that can’t be expressed through words. It can also give shape to difficult ideas. Superior quality is important for all businesses, irrespective of their domain and size. Infographics and video creation services help a business convey its information in unique ways. Infographics are created based on essential factors such as easy to understand, high on information and robust visual appeal, which are important ingredients of social media marketing. Getting clients attention and holding it for long is essential. Infographics are a great way of creating powerful backlinks through viral content. At Popkorn Communications, we offer appealing infographics to the customers. As compared to the other companies offering infographics creation services, our designs use high level concepts and visuals. Not only we create custom infographics design, but also market them to ensure that our clients are set for success. Video is considered as one of the easiest and popular ways to share information and indulge in effective communication across the web. 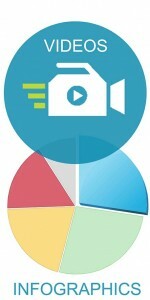 People prefer to watch videos and when a video is seen by thousands, it boosts the website’s ranking and traffic. When a prospect views your message communicated in multi-media videos, it is more effective as compared to simply read plain text. Video marketing has gained prominence among businesses who aim to propagate effective communication. Get in touch for our video creation services and we will sort through the content, create voice file and place everything in a single package for you. Our team uses the latest video production technology and offers what our competitors fail to deliver. We are positioned as one of the premier infographic and video creation services agency in India due to the design quality we bring to the table. Our infographic abilities push the readers to stay longer at the client’s website. The rising expectation of prospects and clients is pushing digital engagement to a new level. Operating as a brand activation agency, we specialize in brand promotion services as well.